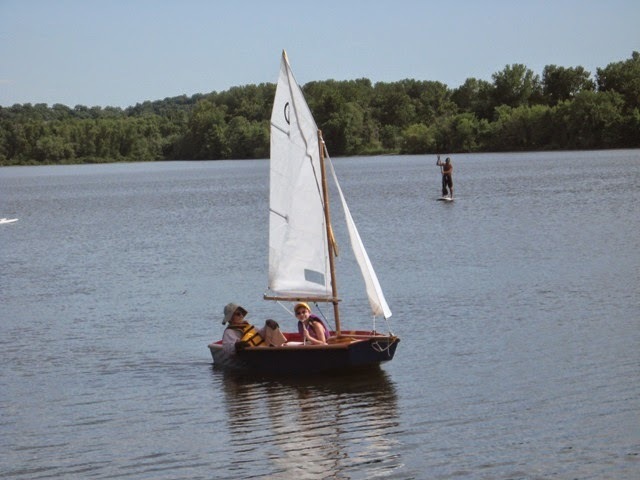 Jack Fritz who lives in Missouri responded with a comment to my recent article about a Walker Bay 10 sailing dinghy. 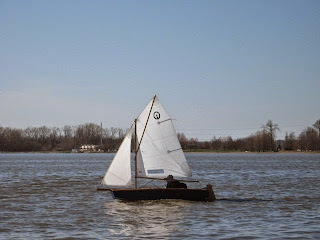 I mentioned I was looking for a small, stable sailing boat that I might use on my local river for day sailing. A Walker Bay 10 might have been suitable, but on looking at her more closely I found certain shortcomings; for example, her sail could not be reefed, and it was impossible to fit an outboard without first removing the rudder. I was delighted that readers came up with suggestions as to a suitable craft. Jack said he was in his mid 70’s and wanted to downsize from a Capri 18. He went on to explain how he built a dinghy based on an Optimist dinghy and if I wanted to learn more about her, he would be pleased to send me photos. He has given me permission to reproduce his email and photos. I wanted to downsize from the Capri 18 and buy a used boat that would be 12' or less in length, as here in Missouri, it need not be titled or registered. And I did not want to have to step a long mast every time that I wanted to sail for an hour two. I also wanted something that could be dropped off of the trailer and ready to go in 15 or 20 minutes. I could not find that such an animal existed, so I hit upon the idea of expanding the Opti to 9'6" in length and 57" in beam. In the attached photos, you can see that the boat fits one grandkid and me just fine. Like you, I really wanted to buy a used fixer-upper but could not find what I wanted. And my wood working skills and equipment were minimal so there was a steep learning curve. 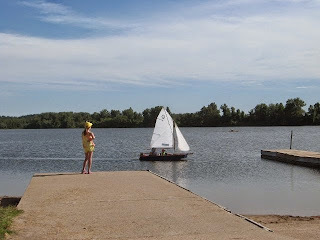 I used the Opti sail and rig design for simplicity, ease of handling and low cost. For added power, I added the 10 square foot jib. Also have read that a sloop rig will outpoint a cat rig; however, I have not yet proved that premise. One photo shows the wood frame made mostly of pine 1 X 2's. The keel board is 1 X 8. In the background, you can see the Dow .55" thick polystyrene which is epoxied to the outside of the wood frame. Two layers of glass cloth and epoxy cover inside and outside. The bare hull weighs about 150 pounds. Bought a trailer from Harbor Freight for $150 and modified it slightly. Works out well. 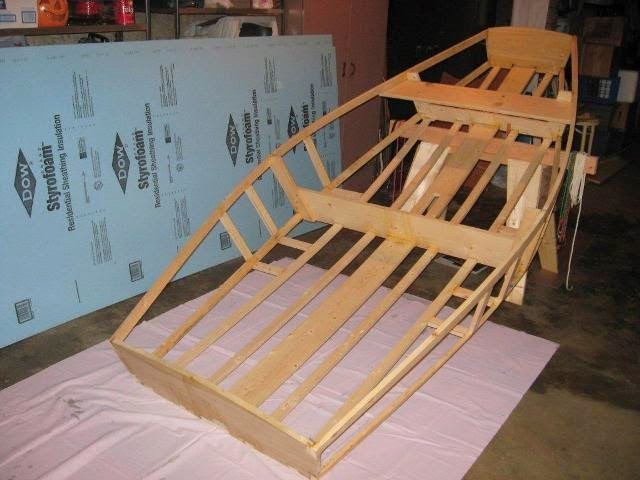 I feel that one could build the same design of 1/4" marine plywood at much less cost and effort. Menards sells that material at very reasonable cost on special order. Construction in the stitch and glue method should be rather simple and cost effective and result in a lightweight hull which could be more readily car-topped. One photo shows me coming in to the dock with my grandson, age 12 with his sister age 10 waiting for a second ride. Winds were rather light but OK. Another photo shows me out in better winds checking out the new sails. I wish you luck in whatever you decide to pursue. Thank you, Jack. I have found a suitable boat, and in due course I’ll be telling people about her. That's really great news Bill. I very much look forward to hearing about your new boat and thanks for sharing Jack's experience with his "Opti-Plus". I had on of these Bill some years ago and really liked it....http://www.jwboatdesigns.co.nz/plans/optimus/. Glad to hear the saps rising again re.your interest in another boat. I am off to the Broads this afternoon for a regatta at Thurne Mouth...should be fun. Will give you a call next week. I'm due to collect the new boat on Saturday 30th. I'll have a few words to say about her after I get home. I hope you had an enjoyable time at the regatta. I'm free for a chat next week - apart from Saturday.